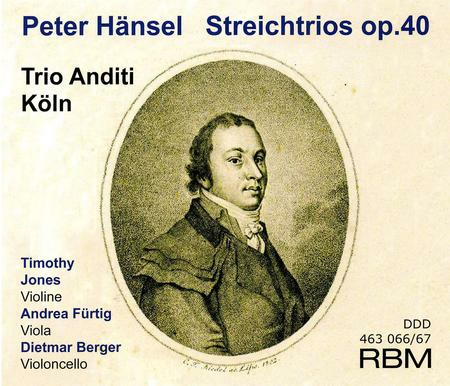 Peter Hansel (1770-1831) composed chamber music involving strings to the exclusion of almost all else, including 58 string quartets, 9 violin duets, 6 string trios and 4 string quintets. The String Trios, op. 40 (1830), recorded here for the first time, represent the culmination of his career and compositional skill. Trio Anditi Koln - Timothy Jones, violin, Andrea Furtig, Viola and Dietmar Berger, cello - play the entire range of existing string trio repertoire, and have earned through their performances an excellent reputation both among the general public as well as music connoisseurs.